Jeanne Crain. Linda Darnell. Ann Sothern. Kirk Douglas. Drama. Comedy. Romance. Recommended. Oscar (Best Director). 01 Tara's Midnight Movies. 01 Ade tastics. 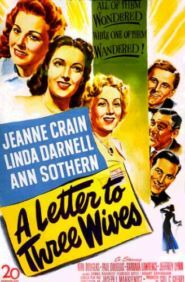 The film opens with shots of a prosperous town and its stately avenues of rich mens' houses, all placidly awaiting the start of the country club season, as the venomously honeyed voice of an unseen female narrator begins spinning a web of speculation and suspicion round three married women, shortly to be completed by their receipt of a poisonous letter indicating that the narrator has run away with one of their husbands. With the three wives trapped for the day supervising a children's picnic, flashbacks start exploring their marital worries, perceptively probing sensitive areas of social and cultural unease. Glitteringly funny at one end of the scale, dumbly touching at the other, it's absolutely irresistible.